We present the results of five experiments on F and Cl partitioning during hydrous mantle melting under conditions relevant to subduction zone magmatism (1.2–2.5 GPa, 1,180°C–1,430°C). For each experiment, we determined the F and Cl partition coefficients between lherzolitic mineral phases (olivine, orthopyroxene (opx), clinopyroxene (cpx), and garnet), amphibole, and hydrous basaltic melts (0.2–5.9 wt.% dissolved H2O). At constant pressure, D F o p x / melt and D C l o p x / melt show contrasting response to the combined effects of decreasing temperature from 1,310°C to 1,180°C and increasing H2O content in the melt from 0.2 to 5.9 wt.%: D F o p x / melt . decreases from 0.123 ± 0.004 to 0.021 ± 0.014 while D C l o p x / melt increases from 0.0021 ± 0.0031 to 0.07 ± 0.01. Similar results are observed for clinopyroxene: D F c p x / melt decreases from 0.153 ± 0.004 to 0.083 ± 0.004 while D C l c p x / melt increases from 0.009 ± 0.0005 to 0.015 ± 0.0008. Experimentally determined F and Cl partition coefficients were used in a hydrous melting model of a lherzolitic mantle metasomatized by slab fluid. In this model, we vary the amount of metasomatic slab fluid added into the mantle while its composition is kept constant. Increasing the amount of fluid results in an increase of both the degree of melting (due to the effect of H2O addition) and the F and Cl input in the mantle wedge. Because of the change of F and Cl partition coefficients with the increase of H2O, the observed variation in the F and Cl contents of the modeled melts is produced not only by F and Cl input from the fluid, but also by the changes in F and Cl fractionation during hydrous melting. Overall, the model predicts that the Cl/F ratio of modeled melts increases with increasing fluid fraction. Therefore, a variation in the amount of fluid added to the mantle wedge can contribute to the variability in Cl/F ratios observed in arc melt inclusions. Volatile species (H2O, CO2, S, Cl, and F) recycling in subduction zones is the main driver of mantle wedge melting and production of arc magmas. Previous studies have shown that primitive arc magmas recorded in olivine-hosted melt inclusions are enriched in volatiles, especially H2O, compared to mid-ocean ridge basalts and/or their melt inclusions (e.g. Hilton et al. , Straub and Layne ; Wallace ). The addition of volatiles in the mantle wedge,via H2O-rich fluids and/or melts derived from the downgoing slab facilitates partial melting in the mantle wedge by lowering the solidus temperature of mantle peridotites (e.g. Kushiro et al. ; Kushiro ; ; ; Mysen and Boettcher ; Gaetani et al. ) and affects the physical and chemical properties of arc magmas (e.g. Shaw ; ; Green ; Mysen ; Sisson and Grove ; Ochs and Lange ; Bercovici and Karato ; Hirschmann ). The composition of the metasomatized mantle wedge can vary greatly according to the nature (aqueous fluids formed from by the dehydration of the slab, or silicate melts, formed by the melting of the slab) and the amounts of slab-derived components added to the mantle (e.g. Ayers ; Grove et al. ; Rüpke et al. ; Straub et al. ). As the slab-derived components are still largely unconstrained, quantifying the volatile input from the slab remains a challenge. Along with H2O, halogen elements such as F and Cl are also released from the slab and are enriched in the mantle wedge (Métrich et al. ; Straub and Layne ). In contrast to H2O and other volatile species, F and Cl are not significantly degassed from mafic magmas at the depth of melt inclusion formation, if at all (Carroll and Webster ; Métrich and Wallace ), because of their comparatively high solubility and low concentration in mafic magmatic liquid (Webster ; Dalou et al. ). Moreover, olivine-hosted melt inclusion studies have shown that F and Cl, unlike H2O, are less affected by post-entrapment diffusion through the host mineral (e.g. Gaetani et al. ; Bucholz et al. ; Lloyd et al. ; Le Voyer et al. ). Therefore, the F and Cl contents recorded by arc melt inclusions represent the product of fractional crystallization from primary melts, and thus they retain valuable information on the source composition of arc magmas. Existing F and Cl data from basaltic melt inclusions recovered from subduction zone settings (e.g. Straub and Layne ; Wallace ; Le Voyer et al. ; ; Bouvier et al. ; ; Sadofsky et al. ; Rose-Koga et al. ) has revealed a high variability of F and Cl signatures (presented as Cl/F ratio in this paper) among volcanic arcs (Cl/F from approximately 0.5 to 10), but also from a single volcano (Cl/F from 1.1 to 4.1 for Shasta melt inclusions, Le Voyer et al. ). One possible explanation for the Cl/F variability in arc melt inclusions is that the addition of an H2O-rich component derived from slab dehydration into the mantle wedge generates arc basalts with high Cl/F, while the addition of slab melts generates basalts with low Cl/F (Straub and Layne ; Le Voyer et al. ). This hypothesis is consistent with experimental data on F and Cl partitioning between minerals and aqueous fluids, which have shown that addition of an aqueous fluid to the mantle wedge efficiently enriches its Cl content but not its F content (Bernini et al. ; Wu and Koga ). Instead, it is suggested that F enrichment is most likely achieved by the percolation of silicate melts (Wu and Koga ). Experimentally determined F partition coefficients between mantle minerals (olivine, pyroxenes, and garnet) and anhydrous silicate melts (Beyer et al. ; Dalou et al. ) allow the calculation of F content in melts produced by simple batch melting of an anhydrous lherzolite (with F =16 ppm, Saal et al. ). The addition of those calculated anhydrous silicate melts (maximum F content approximately 400 ppm) into the mantle wedge does not generate high F content arc magmas (e.g. basaltic andesite melt inclusions from Cascades contain up to 1,220 ppm of F). In order to better assess the link between Cl/F signature and slab input, more experimental data on F and Cl partition coefficients under hydrous conditions, i.e. relevant to subduction zone magmatism, are needed. This is the objective of the present study. We address the effect of H2O on F and Cl partition coefficients between anhydrous minerals (olivine, orthopyroxene (opx), clinopyroxene (cpx), and garnet), amphibole, and hydrous basaltic melts (0.2–5.9 wt.% dissolved H2O), at mantle wedge conditions (1.2 and 2.5 GPa and 1,180°C and 1,430°C). It is shown that the strong and contrasting effect of H2O on F and Cl partitioning is key to the production of F-rich melts and to explain the variability of Cl/F ratios in mantle wedge products. Three starting compositions (Table 1) were prepared as gel mixtures, following the procedure of Hamilton and Henderson (). The two basalts and the peridotite gels were made to be as close as possible in composition to the basalt-peridotite pair of Gaetani and Grove () (basalt 82-72f and peridotite PUM), because a mixed 70:30 proportion of this basalt-peridotite pair allows to obtain liquidus saturation of mantle wedge phases (olivine, orthopyroxene, clinopyroxene, garnet/spinel), while maintaining large melt fractions in both anhydrous and hydrous systems (Gaetani and Grove ). The hydrous basalt composition was prepared without Al2O3 to allow the introduction of H2O as gibbsite (Al(OH)3, Table 1). This protocol allows a better constraint on H2O content than the addition of a drop of liquid water for low H2O content samples. The gibbsite absorbs less atmospheric CO2 than brucite [Mg(OH)2, more commonly used for hydrous experiments, Béarat et al. . The gels were conditioned for 12 h at 800°C in a 1 atm gas-mixing furnace, with f O2 about 1 log unit above the quartz-fayalite-magnetite buffer (QFM). This f O2 was selected to mimic the oxidation state of sub-arc upper mantle (f O2 from 0.5 to 1.7 log units above QFM; Parkinson and Arculus ). Analyses were done by ICP-AES on basalt and peridotite powders. Units in parentheses represent one standard deviation, determined from the ICP-AES standard BHVO-1. aHydrous basalt composition was analyzed before the addition of Al(OH)3.. Al(OH)3 was then added to complete Al2O3 contents, so Al2O3 and H2O are calculated compositions likely associated with a larger error (since reported contents are calculated from weighted Al(OH)3). bMgO of basalt is low to allow the addition of MgF2 and MgCl2. FeO* total Fe as FeO. Starting composition powders were dried for at least 12 h at 110°C to remove any H2O. Starting compositions were weighed to obtain a 70:30 proportion of basalt-peridotite and the desired H2O content by adjusting the proportion of H2O-bearing basalt versus H2O-free basalt. A drop of liquid water (approximately 1 μL) was also added in the H2O-rich samples (Table 2) to recover water lost by possible gibbsite destabilization occurring during arc welding. The F and Cl were weighted and added to the mixtures as MgF2 and MgCl2 to be in trace amounts (approximately 2,000 ppm each). Nevertheless, prior contaminations in F (from the capsules’ preparation, discussed in the ‘experimental procedure’ section) or Cl (from the powder storage in the oven containing NaCl cylinders) make the assessment of the initial F and Cl content difficult. Each mixture was then ground in an agate mortar with ethanol for 45 min. Finally, clinopyroxene seeds were added at the bottom of the sample capsules in experiments CD1 H0 and CD2H3 (Table 2) to catalyze cpx growth (Dalou et al. ). aNew names are used to identify samples from Dalou et al. () (CD1) from samples from this study (CD2). b β basalt, Hβ hydrous basalt, π peridotite, cs cpx seeds, H 2 O drop of liquid H2O. cMeasured concentration of H2O dissolved in the glass. d Opx orthopyroxene, Cpx clinopyroxene, Amp amphibole, Glass quenched basaltic glass. eSquare root of an average of phase proportion calculations, modified from Albarède and Provost (), to account for the addition of F, H2O, and Cl in the starting materials (that diluted the initial element concentrations, see section ‘Equilibrium considerations’ for details). There is a significant uncertainty regarding volatile element initial contents. FeO was excluded from mass-balance calculations (FeO loss or gain is assessed after the phase proportions are determined). fDifference between the FeO content of the bulk composition used as starting material in the mass balance (diluted with F and H2O content) and the FeO in the sample bulk composition as determined by mass balance calculation, in relative weight percent. Positive value indicates apparent Fe gain, while negative value indicates apparent Fe loss. gCapsules F contaminated during HF cleaning. Experiments were conducted at 1.2 and 2.5 GPa and from 1,180°C to 1,430°C on ¾-inch and ½-inch piston cylinders at the Laboratoire Magmas et Volcans (LMV). Four- to six-day durations were chosen for experiments to optimize crystal size and to reach equilibrium (see results for more details on equilibrium considerations, Table 2). To reduce H2O and Fe losses from the starting material, Au80Pd20 double capsules, pre-saturated in Fe, were used. Moreover, because of the high H2O incompatibility in olivine (e.g. Hauri et al. ), San Carlos olivines ground to approximately 10 μm were packed in the outer capsules (Figure 1). The pre-saturation in Fe consists of melting the starting basalt in those capsules, at the hotspot of a vertical gas-mixing furnace at 1,250°C, with f O2 controlled at 1 log unit below the FMQ buffer, for 72 h. The pre-saturation f O2 was chosen to be lower than the starting material f O2, since the basalt used for Fe pre-saturation was the unreduced starting gel and a pre-saturation at higher f O2, being more efficient (Ratajeski and Sisson ), may have caused a Fe increase in samples. After the pre-saturation, the capsules were placed in an HF bath for 48 h at 90°C, followed by three ultrasound baths in distilled water of 1 h each. The capsules were then cleaned in a HNO3 − at 60°C to dissolve SiF precipitates and finally rinsed with distilled water. This procedure allowed the perfect dissolution of basaltic melt, but revealed that F contaminated the metallic capsules (up to several percent for samples CD2H4, CD2H5, and CD2H6, Table 3). However, this contamination does not significantly affect the determination of F and Cl partition coefficients (see ‘Results’ and ‘Discussion’ sections for more details). The pre-saturation procedure minimizes Fe loss from samples (<1.5 wt.%) but sometimes leads to an apparent Fe contamination from the capsule to the sample (Fe contamination up to 1.8 wt.%, Table 2). Overall, this Fe enrichment remains minimal compared to the Fe loss for experiments without pre-saturation (e.g. up to 4 wt.% and 2.9 wt.% average of Fe loss for similar conditions, Kawamoto and Hirose ). Back-scattered electron images of sample CD2H3 (A), (B). The rectangle zone in A enlarged to show coexisting minerals and interstitial melt in light gray, and (C) the rectangle zone in B enlarged to show cpx rims around small opx. Abbreviations used: Ol olivine, Opx orthopyroxene, Cpx clinopyroxene, and Melt quenched melt. The white part is the metal capsule noted as Fe-AuPd, i.e. AuPd pre-saturated in Fe. In the outer capsule, recrystallized olivine is visible. Mineral grains have >30-μm diameter, which is appropriate for SIMS measurements. The smallest opx has quench growth cpx around them (C). For analysis, we only used the largest opx (>50 μm) showing no cpx rims around them. Dendritic textures are observed as a boundary layer between crystallized areas and the melt pool. Except for this dendritic boundary, the melt is perfectly quenched. Numbers in brackets indicate number of individual ion probe analyses included in average. Numbers in parentheses represent one standard deviation in terms of least units cited. A negligible water loss from the inner capsule to the surrounding olivine was measured by ion probe in sample CD2H3 (238 ± 1 ppm H2O loss, compared with the 2.6 wt.% dissolved in the melt). We also checked potential CO2 contamination by Fourier transform infrared analysis (LMV) of sample CD2H5. Less than 100 ppm of CO2 was measured in the melt. Major element concentrations (given in Table 3) were analyzed by a Cameca SX100, LMV electron microprobe. Minerals were analyzed with a focused beam and a 15 nA current, whereas melts were analyzed by using a 8 nA current and a beam defocused to 5–20-μm diameter. The calibration standards, counting times, and choices of spectrometers are described in Hammouda (). The abundance of F, Cl, and H2O (given in Table 3) was determined at the Woods Hole Oceanographic Institution (WHOI) with a Cameca IMF 1,280 ion probe following the procedure described in Rose-Koga et al. (), Shimizu et al. (), and Dalou et al. (). A Cs + primary ion beam rastered over an area of 30 × 30 μm2 was used. The primary beam intensity was approximately 1.43 nA during crystal analyses and decreased to 520 pA for melts. The beam size was between 20 × 20 to 10 × 10 μm2, depending on the size of the phases. At those conditions, the detection limit is <5 ppm for F, <2 ppm for Cl, and <0.01 wt.% for H2O. To achieve reliable F and Cl concentration measurements: 1) three to ten spots were measured per phase, and 2) only data with stable signals (less than 20% signal variation during analysis) were selected and used to determine element abundances. The total uncertainty, taking into account both the standard deviation over ten cycles of analyses (i.e. internal error) and the errors on the regression of the calibration line, was approximately 10% for all volatiles. The results of hydrous experiments are compared with anhydrous analog samples CC4#7b and C4p#25 kb from Dalou et al. (), synthesized at 1.2 and 2.5 GPa, respectively. To facilitate the comparison, we use the following notation: CD1, refers to renamed samples from Dalou et al. (); and CD2, refers to samples from this study (Table 2). Figure 1 shows back-scattered electron images (BSE) of sample CD2H3. Sample textures are appropriate for microanalysis since pools of homogeneous quenched melt are segregated from crystal grains. No bubbles were observed in basaltic glasses, suggesting that the maximum of H2O content added to the starting materials (approximately 6 wt.%) was less than that needed for water saturation in these melts at pressure and temperature conditions of this study’s experiments. Iron contents measured in capsules (between 0.2 and 0.5 wt.%) suggest a f O2 during the experiment varying from approximately QFM +0.4 to QFM +1, depending on the experiment [following the solution models of Barr and Grove () and Balta et al. ()]. The degree of crystallization in runs varies from 32% to 72% (Table 2). The grain sizes are sufficiently large (>30 μm) to determine concentration of volatiles except for cpx in sample CD2-2.5GPa (≤30 μm). The mineral assemblage (Table 2) varies between samples due to variable pressure and temperature (P-T) conditions and to the abundance of volatiles (H2O, F, and Cl). Olivine is present in sample CD2H3 only, as large euhedral crystals (>50-μm diameter). Orthopyroxene is present in all experiments, forming polyhedral grains of 10- to 50-μm diameter, whereas cpx forms polyhedral grains of 5- to 50-μm diameter. Clinopyroxene rims (approximately 5-μm wide), overgrown during quenching, are also observed around some small opx crystals (<20 μm, Figure 1C), which were not analyzed for F and Cl. Dendritic clinopyroxene is also observed at the boundary between crystallized and quenched melt (Figure 1b). Garnet (<30-μm diameter) forms at 2.5 GPa, and is evenly distributed within the capsules. Amphibole is crystallized only in cpx-free samples at temperatures (1,180°C and 1,200°C) higher than typical stability conditions (stable up to 950°C at 1 GPa, Eggler ), forming large euhedral crystals (approximately 300 μm). This higher temperature is likely because F increases amphibole stability (Ferguson ). Several observations indicate that the experiments approached equilibrium after 4–5 days. These observations include 1) polygonal crystal shape suggesting equilibrium growth (Figure 1); 2) lack of detectable compositional zoning in crystals (>20 μm); and 3) lack of compositional heterogeneity of melt (based on small standard deviations of replicate analyses, Table 4). Major element compositions of minerals and melt, presented in Table 4, agree with previous data (samples B333, B305, B304, B330, and B329 of Gaetani and Grove , synthetized at same pressure and similar temperatures and H2O contents) in which the attainment of equilibrium was demonstrated via a reversal experiment (B277, Gaetani and Grove ). Only sample CD2H5 shows some compositional deviations from previous experimental results. Specifically, the melt is richer in SiO2 by 5 wt.%, compared with data from Gaetani and Grove () at similar conditions. Numbers in brackets indicate number of individual electron microprobe analyses included in average. FeO* total, assuming all Fe as FeO. aAnalyses with low stoichiometry, not discussed in the text. The attainment of chemical equilibrium is further inferred by comparing the Fe-Mg exchange coefficient between olivine and melt, K O l / Melt d F e ‐ Mg = F O l e 2 + . M Melt g / F Melt e 2 + . M O l g , with that of previously reported values from anhydrous experiment data (Roeder and Emslie, ; Toplis, ). In the olivine-bearing sample (H3V04), the K O l / Melt d F e ‐ Mg value is 0.30 and the predicted value, from the Toplis () model, is 0.29 (±0.03). 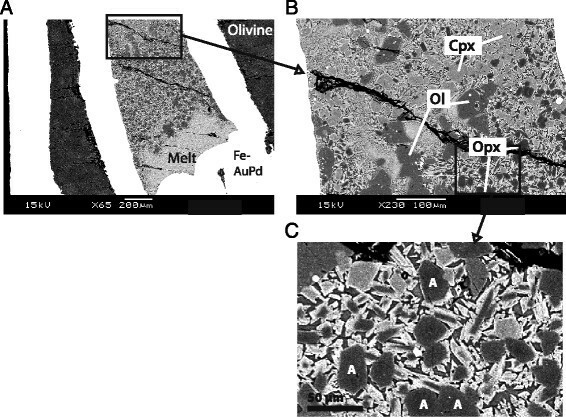 In olivine-free experiments, the Fe-Mg exchange coefficients between opx (or cpx) and melt measured in some of the volatile-poor experiments (CD1 H0, CD2H3, and CD2-2.5GPa: 0.25–0.32 ± 0.01 for opx, and 0.29–0.39 ± 0.02 for cpx) are similar to those of Gaetani and Grove (; 0.30–0.34 for opx and 0.32–0.35 for cpx). In F-contaminated samples (approximately 12–15 wt.% F), Kd values are significantly higher than the Gaetani and Grove () values (0.52 ± 0.004 for CD2H6 opx and 0.59 ± 0.01 for CD2H5 cpx). Filiberto et al. () showed that the Kd values increase with increasing F content in the melt. They show that at 2.9 wt.% F in anhydrous basalt glass K O l / Melt d F e ‐ Mg K O p x / Melt d F e ‐ Mg is 0.40. They suggest that F complexes with Mg in the melt and thus increases the silica activity of the melt, depresses the liquidus, and changes the composition of the crystallizing minerals. Finally, one sample (CD2H5) has a K O p x / Melt d (0.18 ± 0.03) that is lower than that of Gaetani and Grove (). This may indicate that a significant portion of iron in the melt is Fe3+, most likely due to a loss of H during this experiment. Finally, equilibrium is assessed by error-weighted mass-balance calculations (Albarède and Provost ) of the major element abundances. It verifies the closure of the chemical system in our experiments. Within uncertainty, results of mass-balance calculations account for the mixing proportions of basalt and peridotite and volatile elements (F, Cl, and H2O). The square root of the sum of residual square calculations (√ΣR2) ranges between 0.1% and 1.58% (Table 2). The main portions of these residuals likely relate to unknown uncertainties in F, Cl, and H2O abundance in the starting materials, which explains why √ΣR2 is significant (>0.5%). Minerals have balanced stoichiometry (examined with total cations), except for orthopyroxene in sample CD2H4 (total cations in M1 site ≤1.9, instead of 2) and clinopyroxene in sample CD2-2.5GPa (total cations in M1 site >1.5, generally <1.2). For this reason, F and Cl data in orthopyroxene in sample CD2H4 and clinopyroxene in sample CD2-2.5GPa will not be discussed any further. Fluorine and chlorine contents are homogeneous in minerals and melt (Table 3), with standard deviations less than 5% relative for F and less than 12% for Cl in olivine, opx, cpx, and garnet. These variations are smaller than the internal precision of a typical analysis. Table 5 reports F and Cl mineral/melt partition coefficients ( D F mineral / melt and D C l mineral / melt ) In samples synthetized at 1.2 GPa and at about the same temperature (±60°C), D F o p x / melt decreases from 0.056 ± 0.003 to 0.021 ± 0.031 and D F c p x / melt decreases from 0.114 ± 0.002 to 0.08 3 ± 0.004 with increasing H2O content (from 2.6 to 5.9 wt.%), while D C l o p x / melt increases from 0.020 ± 0.0006 to 0.069 ± 0.010 and D C l c p x / melt increases from 0.011 ± 0.001 to 0.015 ± 0.008 (Figure 2). 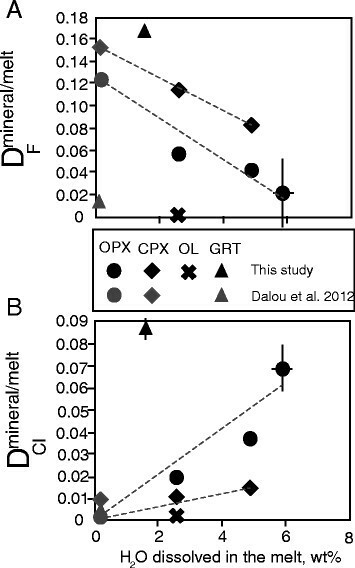 The Dmineral/melt can be compared between olivine, opx, and cpx in sample CD2H3, where all three phases are coexisting: Dcpx/melt > Dopx/melt > Dol/melt for both F and Cl, consistently with Hauri et al. (), Dalou et al. (), Beyer et al. (). The amphibole/melt partition coefficients for F and Cl are higher than for nominally anhydrous minerals (NAMs) ( D F a m p / melt = 0.360 ± 0.066 − 0.635 ± 0.087 and D C l a m p / melt = 0.199 ± 0.044 − 0.378 ± 0.081 ). The F partition coefficients between amphiboles (fluor-pargasitic hornblende) are lower than experimentally determined D F a m p / melt in basaltic system (0.9–1.2, Hauri et al. ) at higher H2O content, than D F between K-richterite and melt (0.9–1.8, Edgar and Pizzolato ) and than D F a m p / melt modeled by Giesting and Filiberto () ranging from 4 to 13 (undersaturated conditions). The amphibole/melt partition coefficients for Cl are consistent with the range of D C l a m p / melt determined by the Giesting and Filiberto () model (approximately 0.08–3), undersaturated conditions). At 2.5 GPa and 1,340°C, D F o p x / melt is 0.046 ± 0.001 and D C l o p x / melt is 0.006 ± 0.0005, smaller than D F garnet / melt (0.166 ± 0.002) and D C l garnet / melt (0.087 ± 0.004). Note that D F mineral / melt are greater than D C l mineral / melt for all NAMs, which is consistent with the results of Dalou et al. () and Hauri et al. (). CD1 data presented to compare anhydrous and hydrous data. Comparison of D F and D Cl variations. Comparison of DF (A) and DCl (B) variations with increasing H2O content dissolved in the melt, at 1.2 GPa, for nominally anhydrous minerals (NAMS): orthopyroxene (diamonds), clinopyroxene (circles), olivine (cross) and garnet (triangle). Samples CD1 from Dalou et al. () are shown in grey, while samples of this study are shown in black. The two trends are linear regression on opx and cpx data. The effect of H2O content on the partitioning of F and Cl can be observed by comparing hydrous data from this study with the experiments from Dalou et al. () performed at similar but anhydrous conditions. For example, at 1.2 GPa, Dopx/melt and Dcpx/melt can be compared with CD1 H0 of Dalou et al. (), also performed at 1.2 GPa (0.123 ± 0.004 versus 0.153 ± 0.004 for F, 0.002 ± 0.001 versus 0.009 ± 0.0005 for Cl, respectively, Table 5). Moreover, D F o p x / melt values in anhydrous and hydrous samples (0.123 ± 0.004–0.021 ± 0.031 at 1.2 GPa; 0.016 ± 0.001–0.046 ± 0.001 at 2.5 GPa) are in overall agreement with Beyer et al. (; 0.031 ±0.005 at 1 GPa, 0.037 ±0.001 at 2.5 GPa) who conducted anhydrous experiments in the CaO-MgO-Al2O3-SiO2 system. For F, the D opx/melt (Beyer et al. ; Dalou et al. ) and D cpx/melt (O’Leary et al. : 0.087 ± 0.004; Dalou et al. ) of dry experiments are lower that the ones in hydrous experiments (O’Leary et al. : 0.051 ± 0.001–0.069 ± 0.001; this study); the D C l o p x / melt is higher in the case of Cl (Hauri et al. ; Dalou et al., ; this study). This difference is consistent with the contrasting effect of increasing water content on the mineral/melt partitioning of F and Cl described above. The D F o l / melt value (0.116) of Dalou et al. () was dismissed because it is two orders of magnitude higher than that reported by Beyer et al. 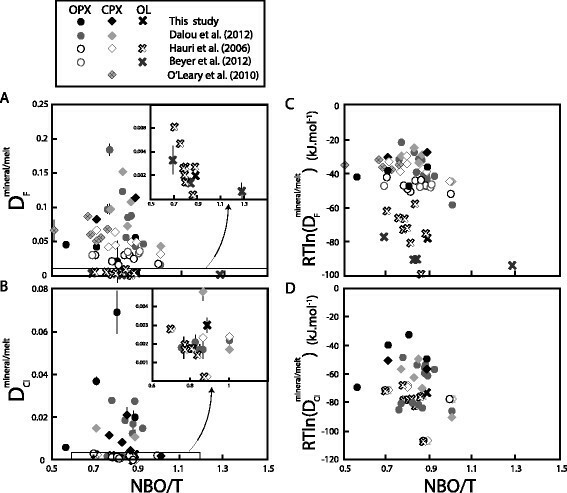 () at similar P-T conditions in the CMASF (CaO, MgO, Al2O3, SiO2, and F) and NCMASF (Na2O, CaO, MgO, Al2O3, SiO2, and F) systems and by Hauri et al. () in basaltic and basanitic systems. The discrepancy between these data is perhaps due to the presence of micro-inclusions, clinohumite lamellae, or clumped OH/F defects (Crépisson et al. ) in the high F olivine (Dalou et al. ). Thus, in the rest of the discussion, we used the average D F o l / melt and D C l o l / melt from Hauri et al. (), of 0.0026 ± 0.0001 and 0.0003 ± 0.0001, respectively. These averages are in a very good agreement with our data in the hydrous sample CD2H3: D F o l / melt 0.002 ± 0.0001 and D C l o l / melt 0.003 ± 0.004 . Although the error on D C l o l / melt is significant, we decide to use this value because to date, no other values are available, except for maximum values given by Hauri et al. (; ranging from 0.002 to 0.003). For garnet, the D F garnet / melt (0.166 ± 0.002) and D C l garnet / melt (0.087 ± 0.004) of hydrous sample CD2-2.5GPa is higher than D F garnet / melt (0.012 ± 0.0004) and D C l garnet / melt (0.003 ± 0.0001) of anhydrous sample CD1-2.5GPa (2.5 GPa, Dalou et al. , which is the only dry sample for which F and Cl partition coefficients were determined for garnet). We calculated the bulk D F bulk and D C l bulk ( D 0 bulk see Table 6) between an anhydrous spinel lherzolite containing 57% olivine, 28% opx, 13% cpx, and 2% spinel; (Workman and Hart ), and 1) anhydrous or 2) hydrous basaltic melt. These D values are 0.056 ± 0.002 for F and 0.0019 ± 0.0004 for Cl in the case of anhydrous melting and 0.018 ± 0.009 for F and 0.023 ± 0.005 for Cl in for hydrous melting, with 5.9 wt.% of H2O dissolved in the melt. Thus, from anhydrous to hydrous lherzolite melting, F becomes more incompatible (from 0.056 to 0.018) and Cl less incompatible (from 0.002 to 0.023). These results indicate that behavior of F and Cl become decoupled during hydrous melting. In the case of amphibole-bearing lherzolite (60% olivine, 20% opx, 15% cpx, and 5% amphibole), modeled bulk D F bulk and D C l bulk ( D 0 bulk ) between amphibole-bearing lherzolite and hydrous basaltic melt are 0.048 ± 0.004–0.050 ± 0.011 and 0.013 ± 0.005–0.037 ± 0.009, respectively with increasing H2O content (from 4.3 to 5.9 wt.%). Nevertheless, in the melting model presented below, we used an amphibole-bearing wehrlite (Médard et al. ), because to date no melting modes are available for amphibole-bearing lherzolite. In the case of amphibole-bearing wehrlite (20% olivine, 28% cpx, and 52% amphibole; Médard et al. ), the high proportion of amphibole enhances its role during melting; modeled bulk D F bulk and D C l bulk ( D 0 bulk ) used in the hydrous melting model are 0.219 ± 0.0002–0.353 ± 0.0003 and 0.066 ± 0.023–0.201 ± 0.043, respectively with increasing H2O content (from 4.3 to 5.9 wt.%). aFrom Johnson et al. (). bFrom Hauri et al. (), we used average value of D F and D Cl between olivine and basaltic melt. D o bulk = Σ D i mineral/melt · X i mineral, where X is the proportion of mineral in the anhydrous lherzolite and D i mineral/melt are presented Table 5. P i bulk = Σ D i mineral /melt · p i mineral, where p are the stoichiometric coefficients of melting (see text). D i bulk = [D o bulk − (P i bulk · χ)]/(1 − χ), where χ is the degree of melting. It is not possible to completely separate the effects of temperature and H2O on the F and Cl partition coefficients (Figure 2) because in order to obtain multi-phase assemblages in the experiments, it is necessary to decrease the temperature as the H2O content of the system is increased, to account for the effect of water on the solidus temperature of the peridotite phase assemblage (e.g. Kushiro ). Moreover, we found no clear relationship between D F mineral / melt or D C l mineral / melt and the F content dissolved in melts (Table 3), which supports the conclusion that the fluorine contamination from HF capsule cleaning (up to several weight percent, Table 3) cannot explain the F and Cl partition coefficient variations among the samples. The contrasting changes of F and Cl partition coefficients between pyroxenes and melt with increasing water content (i.e. decreasing temperature) is, therefore, the result of either 1) the effect of H2O and temperature on melting phase relations and phase composition, 2) their effect on the melt structure, or 3) a combination of both. Mineral/melt partition coefficients of fluorine (A) and chlorine (B) versus NBO/T, (C) RTln D F mineral / melt versus NBO/T and (D). RTln D C l mineral / melt versus NBO/T, where R is the gas constant and T the temperature in K. Here RTln D volatile mineral / melt is equal to ∆G, the free Gibbs energy; NBO/T were calculated following the procedure in Mysen and Richet (, Chapter 4) as explained in the text. Data from this study are compared with literature data for olivine (Hauri et al. ; Beyer et al. ), orthopyroxene (Hauri et al. ; Beyer et al. ; Dalou et al. ), and clinopyroxene (Hauri et al. ; O’Leary et al. ; Dalou et al. ). where m is the slope value of NBO/T versus H2O (mol fraction) from Mysen (; for NS4NA7.5 composition, similar NBO/T and similar Al2O3 content as our basaltic melts), and [F] is the F mol fraction of each sample. This correction allows deciphering the effect of H2O from the effect of F on NBO/T in Figure 3. Figure 3A,C shows that, for each mineral (from the literature data and this study), F partition coefficients tend to decrease with increasing H2O-induced NBO/T variations, i.e. with increasing melt depolymerization. In contrast, there is no obvious correlation between Cl partition coefficients for pyroxenes and NBO/T (Figure 3B,D). We interpret that the scattering of D Cl versus NBO/T reflects the fact that mineral chemistry has a significant role in D Cl variation, as suggested by Bernini et al. () and Dalou et al. (). For example, a mild correlation between Cl substitution and octahedral site elasticity has been demonstrated by Dalou et al. (). In contrast, Dalou et al. () found no direct correlation between D F and pyroxene chemistry or elastic parameters. Fluorine, being smaller than Cl (133 and 181 pm, respectively), is more sensitive to melt structure than Cl (Dalou et al. ). The same relationship between ion size and melt depolymerization was previously found for cations (e.g. Gaetani et al. ). Previous work on F and Cl solution behavior in aluminosilicate melts (Mysen and Virgo ; Kohn et al. ; Schaller et al. ; Zeng and Stebbins ; Mysen et al. ; Zimova and Webb ; Baasner et al. ) have shown that F preferentially bonds with tetrahedrally coordinated cations such as Al and Si. Although in more complex melts such as basalt, F can also preferentially bond with Mg (Kiczenski et al. ; Filiberto et al. ) and form more complex bonds as Al-F-Ca or Al-F-Na (Zeng and Stebbins ; Mysen et al., ); Si-F and Al-F are always found. Moreover, as NBO/T increases, F bonding and dissolution in silicate melts is favored (Mysen et al. ). In contrast, Cl preferentially bonds with network-modifier cations (Ca, Na, K; Stebbins and Du ; Sandland et al. ; Zimova and Webb ; Dalou and Mysen ; Baasner et al. ) or with Fe2+ in F-rich basalt (Filiberto and Treiman ; Filiberto et al. ), and its solubility in aluminosilicate melts decreases with increasing NBO/T (Dalou and Mysen ). Assuming that F and Cl solubility response to NBO/T in compositionally simple aluminosilicate melts can be extended to basaltic composition, F and Cl solubility response to NBO/T can explain changes of F incompatibility and partly Cl incompatibility. As shown above, the variation of melt structure in our experiments is mainly due to the variation in dissolved H2O content. Therefore, the variation in H2O content dissolved in melts is the main cause of our F partition coefficient variation and also could have a role of the Cl partition coefficient variation. This is consistent with recent F and Cl solubility results in aluminosilicate melts with increasing H2O content (Dalou and Mysen ) where increasing H2O content in the melt results in increased F. This means that mineral/melt partition coefficients decrease with increasing H2O and results, therefore, in decreased mineral/melt partition coefficients for chlorine. The D F lherzolite / melt and D C l lherzolite / melt were used to calculate the F and Cl composition of melts derived from a spinel lherzolite (57% olivine, 28% opx, 13% cpx, and 2% spinel; Workman and Hart ) metasomatized by various proportions of aqueous fluids. In this model, we assume that the partial melts are undersaturated in aqueous fluids because our experiments are undersaturated in H2O. Therefore, the model follows the flux-induced melting proposed by Stolper and Newman () and Eiler et al. (). The equation chosen is derived from Eiler et al. () modified to represent non-modal melting following the equation by Johnson et al. () (Table 6). In this study, alpha (α) values were chosen to be 0.026, 0.049, 0.059, and 0.10, because α corresponds to the H2O content dissolved in melts during the experiments (2.6, 4.9, and 5.9 wt.%, Table 6). Although no experiment was performed with 10 wt.% H2O dissolved in the melt, α = 0.10 was chosen to test the model reaction to a high rate of fluid-induced melting. The P ¯ i lherzolite / arc magma is calculated from stoichiometric coefficients for spinel lherzolite melting reactions under anhydrous and hydrous conditions using Kinzler () and Gaetani and Grove (), respectively. For amphibole-bearing lithology, the stoichiometric coefficients of an amphibole-bearing wehrlite from Médard et al. () were chosen. In the melting calculation, the degree of melting, χ, of the metasomatized lherzolite was varied from 1% to 20%. The composition of the anhydrous lherzolite is the depleted upper mantle composition (F = 16 ppm and Cl = 0.83 ppm) from Saal et al. (). Three different compositions of slab components, C i slab flux , were tested. Two different aqueous fluids: F = 990 ± 270 ppm, Cl = 9,390 ± 2,500 ppm, and H2O = 25 ± 7 wt.% from Straub and Layne () and F = 2,200 ppm, Cl = 8,900 ppm, and H2O = 53 wt.% from Le Voyer et al. () were used; together with one slab derived melt: F = 13,700 ppm, Cl = 14,800 ppm, and H2O = 44.5 wt.% from Le Voyer et al. () (Figure 4). Modeled melt Cl/F ratios are shown as a function of degrees of fluid induced melting. Model tests three slab components (stars): slab fluid composition from Straub and Layne () (black star), slab fluid composition from Le Voyer et al. () (grey star), and slab melt composition from Le Voyer et al. () (white star). Lines exhibit the variation of the rate of fluid-induced melting, by changing α values: 0.026 (dashed lines), 0.049 (dotted lines), and 0.059 (solid lines). Crosses are calculated points from the model joined by the lines for more clarity. The black diamond shows the depleted mantle composition. The grey rectangle on the side of the diagram shows the range of Cl/F in arc melt inclusions (Straub and Layne ; Elburg et al. ; Wysoczanski et al. ; Churikova et al. ; Portnyagin et al. ; Sadofsky et al. ; Vigouroux et al. ; Bouvier et al. ; ; Le Voyer et al. ; ; Sorbadere et al. ; Shaw et al. ; Rose-Koga et al. ). The Cl/F ratio is determined by the slab component, the degree of melting, but also the rate of fluid-induced melting. In other words, it means that the amount of fluid component has an influence of the Cl/F ratio in melts. Interestingly, at low degrees of slab fluid-induced melting (1% to 10%), Cl/F ratios in melts are higher for α = 0.049 than for α = 0.059. This is because Cl content in the melt is controlled by increasing incompatibility in opx and the dissolution of opx with increasing α. This simple model illustrates how an increase in the proportion of metasomatic fluid affects magma composition in two ways: (1) the degree of melting increases; and (2) more metasomatic component (mostly H2O and Cl) resides in the final magma. In other words, the model illustrates the competition between fractionation and dilution of F and Cl. Note that this model calculation is aimed to assess the role of variable F and Cl partition coefficients in wet and dry mantle, in order to extract robust systematics. It emphasizes the basic framework of the fluid-induced melting, but ignores potential complication of arc magma genesis such as reactive fluid and melt transport, super-adiabatic and adiabatic melting. With increasing degree of melting, χ, the Cl/F ratio in the final melt increases independently of the composition of the slab fluid (Figure 4). This ratio also increases with increasingly Cl-rich metasomatic fluids. Therefore, both the fluid composition and degree of melting are the major variables controlling the melt Cl/F values. The increasing degree of melting has more effect on the Cl/F ratio than α, the rate of fluid-induced melting (Figure 4). For example, at constant degree of melting (20%), the Cl/F ratio of melts increases by a factor of 1.3 (from 5.2 to 6.7) as the melt H2O content varies from 2.6 to 5.9 wt.%. In comparison, for α = 0.059, Cl/F increases by factor of 6.4 (from 1.0 to 6.7) from 1% to 20% degree of melting. Figure 5A reports F and Cl concentrations in melt inclusions from various volcanic arcs (grouped in arcs: Trans-Mexican: Sadofsky et al. ; Vigouroux et al. ; Kamchatka: Churikova et al. ; Portnyagin et al. ; Kermadec: Wysoczanski et al. ; Izu-Mariana: Straub and Layne ; Shaw et al. ; Sunda: Elburg et al. ; Aeolian: Rose-Koga et al. ; Cascade: Le Voyer et al. ; S. America: Le Voyer et al. ; Vanuatu: Sorbadere et al. ; Lesser Antilles: Bouvier et al. ; ) and illustrates the variety of Cl/F ratios among arc magmas (between 0.25 and 10). Although the variations of degree of melting and crystallization are likely responsible for some of F and Cl variation within each group of arc melt inclusions, it is unlikely that crystallization is solely responsible for these variations. For instance, Le Voyer et al. () investigated the variation of volatile elements signature among Mount Shasta melt inclusions, by minimizing the effect of melting-crystallization normalizing F and Cl content to Y content (incompatible, fluid-immobile element). It appears that Mount Shasta melt inclusions display two trends of Cl/Y versus F/Y that corresponds to two distinct Cl/F ratios of approximately 1 and 4. Therefore, although some of the variation observed on Figure 5A might be produced by variable degree of crystallization of different samples, it is likely that a large part of the Cl/F variations is related to the magma genesis in the mantle wedge. Cl versus F in, (A) arc melt inclusions, slab and mantle wedge, (B, C, and D) predicted melts. 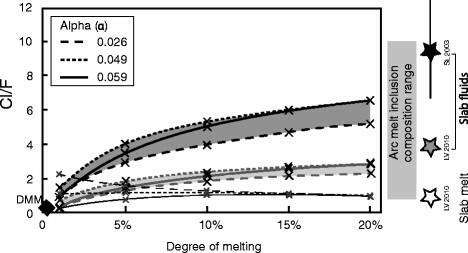 (A) Melt inclusions data are compiled from recent studies (see text). Each thin line represents a constant Cl/F ratio. (B) Melt compositions derived from anhydrous mantle (DMM, blue diamond) are predicted by the dark gray curve. Predicted melts’ compositions calculated for fluid-induced melting of a spinel lherzolite are indicated by the dotted curve for low degree (α = 0.026), dashed for intermediate (α = 0.049), and solid curves for high (α = 0.059) and very high degree of melt production rate for a unit flux (α = 0.1). Fluid composition is from Straub and Layne () (black star). Fluid-induced melting of an amphibole-bearing wehrlite is indicated by gray curves: dashed for α = 0.043 and dotted for α = 0.059. Each curve is graduated as a function of degree of melting (from 1% to 20%). See text for details on the model parameters. The gray line represents the mixing line between the fluid composition (Straub and Layne, ) and the DMM. Compositions of aqueous fluid from Le Voyer et al. () and slab melt from Le Voyer et al. () are shown for comparison (gray star and white star, respectively). (C) F and Cl compositions of melts produced by fluid-induced melting of a lherzolite metasomatized by an aqueous fluid from Le Voyer et al. (). (D) F and Cl compositions of melts produced by fluid-induced melting of a lherzolite metasomatized by slab-derived melt from Le Voyer et al. (). The variations in volatile and trace elements composition are commonly explained by a compositional variation of the metasomatic agent (e.g. Straub et al. ; Le Voyer et al. ; Sadofsky et al. ; Bouvier et al. ; Sorbadere et al. ). The composition of the metasomatic agent is usually calculated from mass balance assuming a mixing between the depleted mantle (DMM) and this agent, either a slab aqueous fluid or a slab melt (e.g. Grove et al. ; Straub and Layne ; Straub et al. ; Le Voyer et al. ). Considering that seawater is about 20,000 times richer in Cl than F (e.g. Straub and Layne ) and that Cl is highly soluble in slab aqueous fluids (e.g. Brenan ), a Cl/F >1 in arc melt inclusions is expected. The Cl/F ratio in aqueous fluid from slab dehydration was estimated to be approximately 4 (e.g. Mount Shasta, Le Voyer et al. ) or up to 9.5 (e.g. Izu arc front, Straub and Layne ). In contrast, the low Cl/F (<1) found in some arc melt inclusions (e.g. Central and South American arcs, Kermadec, Wysoczanski et al. ; Sadofsky et al. ; Vigouroux et al. ; Mount Shasta, Le Voyer et al. ) cannot result from the mixing between a depleted source and an aqueous fluid. Instead, it was suggested that it was produced by mixing with a H2O-rich slab melt (e.g. Le Voyer et al. ), with a Cl/F approximately 1 (Figure 5B). Part of the Cl/F variability in arc melt inclusions could also result from the presence of hydrous minerals as amphiboles or micas, such as pargasite or phlogopite. On Figure 5B, melting trends of an amphibole-bearing wehrlite are reported. This trend is almost parallel to the mixing trend between DMM and fluid and shows that Cl is more fractionated than F during amphibole-bearing wehrlite melting. Melt inclusions from the western Trans-Mexican arc display very low Cl/F (approximately 0.5), which has been interpreted as the melting of a phlogopite-bearing lithology (Vigouroux et al. ). Although more experimentally determined partition coefficients of F and Cl are needed for amphibole and phlogopite, the melting of a mantle with hydrous phases likely would fractionate F and Cl differently than in an anhydrous mantle. The hydroxyl site of hydrous phases such as amphiboles and micas provide ideal substitution sites for F and Cl, therefore D F hydrous mineral / melt and D C l hydrous mineral / melt should be higher than the ones of NAMs. Thus, we suggest that F and Cl fractionation during the melting of amphibole or mica-bearing lithologies may explain some of Cl/F variability in melt inclusions. The effect of H2O on D F mineral / melt and D C l mineral / melt implies that the F and Cl signature in melts is somehow related to the amount of aqueous fluid involved during arc magma genesis. When model results shown in Figure 4, tested for fluid composition from Straub and Layne (), are plotted in the Cl versus F diagram (Figure 5B), the direction of melting trends is determined by the value of α, whereas the extent of the trends are determined by the degree of melting. There is a rotation in the F versus Cl melting trends with the increasing proportion of metasomatic fluids: from a negative slope of Cl versus F at low α to a near-vertical slope at α = 0.1. At low α, the fluid input, and in particular the Cl input from the fluid, is low. Therefore, the melting trend is determined by D F lherzolite / melt and D C l lherzolite / melt . As α increases, there is competition between the F and Cl fractionation (controlled by D F lherzolite / melt and D C l lherzolite / melt ) and the dilution of Cl carried by the fluid. This is why Cl begins to fractionate more than F as α increases and why at very high α, only Cl seems to fractionate. This change of melting trend directions suggest that various Cl/F ratios in melts can be produced by variable rate of fluid-induced melting without changing the composition of the fluid. Interestingly, subvertical alignments of melt inclusion compositions are seen among the Lesser Antilles, Aeolian, and Vanuatu arcs and some of the Cascade arc (Figure 5A). While high α melting trend and data trends may not be an exact match, it is possible that these subvertical alignments result from melting at high fluid content, with a strong fractionation of Cl compared to F. This suggests that (1) the natural highly variable Cl trends we observe probably represent melting trends and (2) those magmas were produced by high degree of metasomatism. In modeled melts, consequently to increasing α, not only Cl increases because of increasing fluid input, but F increases as well because D F mineral / melt decreases with increasing H2O content. Note that the model described here does not challenge the important role of the metasomatic agent in the composition of arc magmas (Figure 5C,D). The nature of this agent, fluid or melt, and its composition also control the slope of melting trends (Figure 5B–D). At high degree of melting (>20%), the melt compositions are near that of melt in the mixing lines between the DMM and slab components. In summary, while the main variability of Cl/F ratio among melt inclusions is produced by the various composition of slab component, within the same arc region or the same volcano at a given time, some Cl/F variability can be explained by variable amount of the same slab component (which has also a strong influence on the degree of melting of the mantle wedge). We report F and Cl partition coefficients between olivine, orthopyroxene, clinopyroxene, garnet and amphibole, and hydrous basaltic melt for P-T conditions ranging from 1.2 to 2.5 GPa and 1180 to 1430°C, with a H2O content dissolved in the melt ranging from 0.2 to 5.9 wt%. We show that increasing H2O content has a contrasting effect on F and Cl partition coefficients between anhydrous minerals and melt. The D F mineral / melt decrease with the increasing melt depolymerization resulting from increasing H2O content. In contrast, D C l mineral / melt increase with melt H2O content. This relationship is complex since Cl behavior depends on both melt and crystal chemistry. Because our experimental conditions are relevant to that of the mantle wedge, our D F mineral / melt and D C l mineral / melt data were used to model Cl/F ratio in arc magmas produced by fluid induced melting. We establish that fluid induced melting can produce high Cl/F and high F content melts, even when the metasomatic agent is an aqueous fluid. Our model shows that the Cl/F variability in arc melt inclusions results from 3 related variables: the composition but also the amount of metasomatic agent released from the slab into the mantle wedge and the degree of melting induced by the amount of metasomatic agent. This research was financed by the French Government Laboratory of Excellence initiative n°ANR-10-LABX-0006, the Région Auvergne and the European Regional Development Fund. This is Laboratory of Excellence ClerVolc contribution number 127. Critical reviews from AE Bjorn Mysen and three anonymous reviewers were greatly appreciated. CD thanks Robert Dennen for his help with English revisions. This research article belongs to no. 4 section: Solid Earth Sciences. KTK conceived and designed the study. CD carried out the experimental study, obtained analytical data with NS, and wrote the manuscript. KTK, ML, and NS collaborated with the corresponding author in the construction of manuscript. All authors read and approved the final manuscript.